The doublefile viburnum (Viburnum plicatum f. tomentosum 'Mariesii',) is a medium-sized deciduous shrub (8 to 16 feet in height) that blooms with white flowers from April to May. The dark green leaves on this dense, multi-stemmed shrub are toothed and oval in shape, turning an attractive burgundy red in autumn. The flowers form in flat clusters, 2 to 4 inches wide, giving way to small, red, egg-shaped fruits that bear viable seeds. Doublefile viburnum shrubs have many landscape applications, from single specimen plants to foundation plantings to shrub borders and massed screens. The various viburnum species are the most commonly planted group of shrubs in North America, for good reason: They are extremely easy to grow, with very few problems. Soil Type: prefers loam, but will do well in any medium-moisture, well-drained soil. Soil pH: prefers slightly acid soil (5.6 to 6.6), but also does well in slightly alkaline soils. Plant this shrub in any well-drained, consistently moist soil for best results. It thrives in full sun but will nicely tolerate some shade. Amending the soil with compost to improve drainage is a good idea in clay soils. Keep the shrubs consistently moist. Where pruning is necessary to shape the shrubs or control there size, it should be done immediately after flowering. This protects next's year's flowers, as well as the berries, which are much favored by birds. 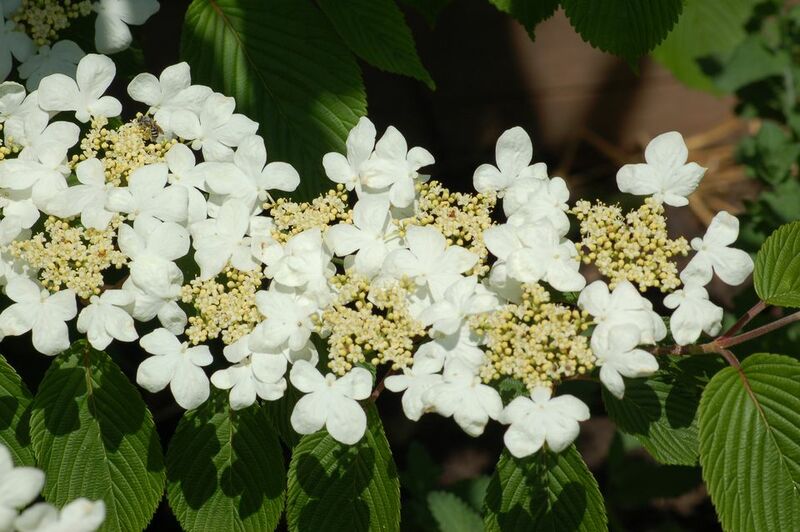 Grow doublefile viburnum in full sun to part shade locations. Full sun will produce the best flowering. This shrub prefers well-drained, loamy, slightly acidic soil, but has a wide range of tolerance for most soil types. It does well with other acid lovers, such as azaleas and rhododendrons. Doublefile viburnum likes to be kept consistently moist, though it will tolerate dry conditions once the shrub is mature. Viburnum likes moderate climate conditions. It does not do well in intense heat (though will survive if it has some shade and is mulched to keep the soil cool), and it may experience frost damage if a warm winter concludes with bitter cold at the end of the season. Like most viburnums, doublefile will appreciate the application of a balanced, time-release fertilizer mixed into the soil in spring. Additional feeding is not necessary. Cut a 3- to 5-inch segment from the end of a softwood branch, making sure the cutting has at least 2 pairs of leaves. The cut should be made about 1 inch below the second set of leaves. Peel off the lower two leaves to create wounds from which the roots will grow. Dip the tip of the cutting and the exposed leaf nodes in powdered rooting hormone (hormone is not absolutely necessary, but will improve the chances of successful rooting). Fill a seedling tray with a good well-drained butting mix containing roughly 60 percent sand or perlite and 40 percent peat moss. (This potting mix can be purchased or made yourself.) Make sure the seedling tray has drainage holes. Plant the cuttings in the seedling mixture, making sure the leaf notes are completely buried. Water the cuttings until the soil is evenly moist, then place the tray in a large, resealable plastic bag or under a plastic dome. Place the tray in a location with full sun to partial shade, where temperatures are between 70 and 75 degrees Fahrenheit. After 5 weeks, check the cuttings for roots; they may be evident through the drainage holes in the bottom of the tray, or you can gently tug on the cuttings to see if there are sufficient roots to keep the cuttings anchored in the soil. When roots are sufficient, transplant the cuttings into 4-inch pots (this usually takes about 4 to 6 weeks). Grow the plants until they are about 1 foot tall, then move the plants outdoors. Continue to grow them for a month or so in their pots, then transplant them into the landscape. Witherod viburnum (Viburnum cassinoides): This North American native for zones 3 to 8 reaches 5 to 12 feet in height and width at maturity. Flat-topped clusters of small, white, bad-smelling flowers appear in June in most regions. Fall foliage ranges from orange to red to purple. The edible berries start out green but eventually proceed through shades of red and blue to a color that is almost black in fall (each berry cluster can contain multiple colors at the same time). The berries persist to provide winter interest as they attract birds. Golden wayfaringtree (Viburnum var. lantana 'Aureum'): Grow this shrub in zones 3 to 7. Its mature dimensions are 8 feet tall with a similar spread. The flowers and the berries are similar to those on V. cassinoides, but what distinguishes this bush is the foliage color. The new leaves sport an unusual golden-yellow color that will eventually fade to green unless the plant is grown in the shade. Fall color is also yellow. Prune this shrub immediately after flowering. Because the shrubs flower on "old wood," pruning immediately after flowering gives them time to develop the growth that will become next spring's old wood. LIght pruning can be done at any time, but when a rejuvenation is needed every few years, start by eliminated any stems that rub together. Remove a full one-third of all stems, and also remove any water sprouts or suckers at ground level. A close relative of the doublefile viburnum is the Japanese snowball bush (viburnum plicatum)—doublefile viburnum is actually a form of V. plicaturm). The primary difference is that the flowers on snowball bush are round, full "snowball" blooms, rather than the flat clusters found on doublefile viburnum. There are also cultivars of Japanese snowball bush that offer pink or pink and white blooms. Although the 'Mariesii' cultivar is relatively pest-resistant, they may experience viburnum leaf beetles (Pyrrhalta viburni) and aphids. Spray neem oil on the plant to kill any aphids as soon as you spot them. The leaf beetles are a more serious problem. Control measures should target the larvae, not the adults. The University of Florida Extension suggests biological control, recommending, specifically, "Predaceous insects like the larvae and adults of multicolored Asian lady beetle, larvae of lacewings, and spined soldier bugs...."
There are no serious disease problems with doubleline viburnum shrubs.